The shallower part of the ocean, before it drops into the deep, often produces turbulent tidal currents. Ship wrecks are not uncommon. Exploring the ruins provides vital information, yet previous subaquatic vehicles have failed to do so. Scientists and engineers from the Korean Institute of Ocean Science searched for inspiration in an unlikely subphylum: crustaceans. The team created Crabster to fight the mighty waves. Weighing in at about as much as a smart car (about the same size too), it will explore wrecked ships formerly unreachable, as tidal currents crash in at 1.5m/s. 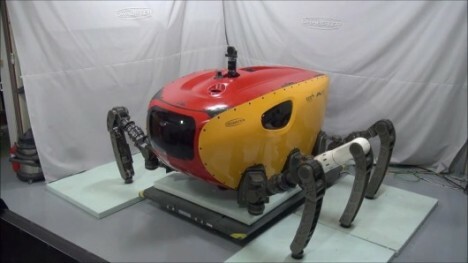 Like real crabs, the Crabster has larger front claws, which will allow it to pick up and store objects in a compartment located on the front of the robot. It can stay below the surface for up to 24 hours, powered by an attached chord that they hope eventually won’t be necessary. 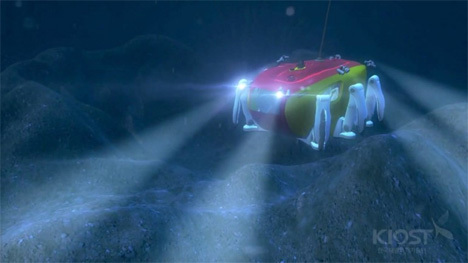 The researchers hope it will eventually explore ancient deep-sea wreckage. See more in Robotics or under Technology. July, 2013.